This term was first described by Vladimir Janda a Czech Doctor. It is also referred to as proximal or shoulder girdle crossed syndrome. In essence it is a muscle imbalance characterised by short tight facilitated pectorals on the anterior aspect crossing with short tight facilitated upper trapezius, levator scapulae and suboccipitals on the posterior aspect. A reciprocal inhibition and weakening of the deep neck flexors on the anterior aspect crosses with inhibition and weakening of the rhomboids, serratus anterior, middle and lower trapezius on the posterior aspect. This muscle imbalance becomes self-fulfilling and encourages forward head posture and protraction of the shoulders. According to Janda it also creates joint dysfunction, particularly at the atlanto-occipital joint, C4-C5 segment, cervicothoracic joint, glenohumeral joint, and T4-T5 segment. Janda noted that these focal areas of stress within the spine correspond to transitional zones in which neighbouring vertebrae change in morphology. More simply put common signs of this condition are forward head carriage, rounded shoulders and an increase in the curve of the upper back. You only have to look around the office or at people walking in the street and observe that most of our population are suffering from this condition. Unfortunately this muscle imbalance causes the body to work inefficiently which leads to a higher use of energy and more strain on the body. Manual therapists spend much of their time treating symptoms generated from this condition. Short pectorals cause rounding of the shoulders and as a result when raising the arms impingement of tendons and muscles at the level of the shoulder joint can occur and will result in inflammation and pain. 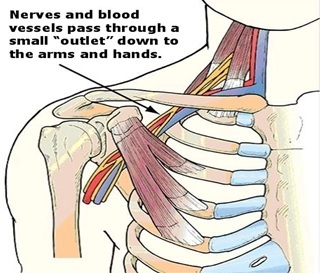 When the shoulders are rounded the clavicles drop onto the first rib which may cause brachial plexus compression. Symptoms associated with this type of entrapment neuropathy are upper extremity pain, numbness, swelling and paraesthesia. Descending and shearing forces come into play at the level of the lower neck due to forward head carriage. These forces may initiate inflammation and disc herniations. The net result over time is early onset disc degeneration ie spondylosis. Also as a result of this situation entrapment neuropathies in the neck are therefore more likely which will also give upper extremity symptoms of pain, numbness and paraesthesia. Short tight suboccipital musculature can irritate nerves and blood vessels in the upper neck which may cause chronic tension type headaches. As a result of an increased curve in the upper back (hyperkyphosis) the ribs movement during breathing is inhibited. This may predispose people to breathing problems. As a result of forward head posture the mandible retracts which alters the mechanics of the TMJ or jaw joints which predisposes them to dysfunction. So what causes this syndrome which appears to be so globally epidemic? Is it purely generated by bad postural habits ie, sitting slouched at desks, driving, reading or watching TV as most manual therapists will lead us to believe? Or is there an underlying catalyst, something else going on setting the scene for this postural abnormality? 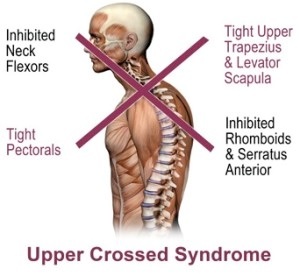 Is Upper Crossed Syndrome purely a biomechanical compensation for forward head carriage? If so what causes forward head carriage? Find out more in Upper Cross Syndrome Part 2 coming soon!